Looking for a new way to spend a weekend in the Sacramento area? RV camping fans will find two Northern California towns, each with its own vintage charm, along historic Hwy 99E. The towns of Chico and Red Bluff are connected by this scenic byway that parallels the Sacramento River, and is also conveniently close to Mendocino and Plumas National Forests. You’ll find plenty to keep you busy on our first stop along Historic Hwy 99. While RV camping near Chico, CA, here are five things you won’t want to miss in this friendly town with an artistic flair. SoPo and The Junction, a vibrant, vintage district where the distinct blend of art, music, eateries and special events make the area a favorite of Chico State students. Thursday Night Market on Broadway, held weekly April through September, is a special treat for Chico visitors hoping to experience artists, artisans, food truck chefs and the town’s eclectic music scene, all in one event. Chico’s Public Art offerings include stunning sculptures, murals and mosaics throughout Downtown Chico. Plan time to see each one on your trip. Bidwell Park, more than three thousand acres on the banks of Big Chico Creek, is one of the largest municipal parks in the country. Whether you’re hiking the more rugged trails of the Upper Park or strolling the serene pathways of the Lower Park, it’s the best way to explore Chico outdoors. Scenic bonus—you can enter the park trail system through Chico’s beautiful City Plaza. Eighth & Main Antique Center in Downtown Chico offers antiques and collectibles hunters nearly thirty thousand square feet of shopping. Come early and be prepared to be amazed at what you’ll find in hundreds of booths over two floors. When you’re ready to pack up the RV and head down the road to Red Bluff, it’s an easy hour’s drive north, IF you don’t stop to take advantage of seasonal fresh fruit and vegetable offerings along the way. Once in Red Bluff, you’ll soon see why Northern California RV travelers mark the town as a favorite stop. Not only is it known for its Western history and a great selection of antique stores, it’s also adjacent to Lassen Volcanic National Park. In other words, camping in Red Bluff always promises fantastic views as well as plenty of entertainment! Take a walking tour of the town’s gorgeous Victorian homes and be sure to tour the Kelly-Griggs House Museum (open Sundays only) to learn even more about the area’s early settlers. and surrender to the wilderness beauty of the region. Whether your idea of outdoor recreation is a quiet walk on a forest trail or fishing an untamed waterway, you’ll find a place to do it in the shadow of Lassen Peak. Visit Gaumer’s Jewelry & Museum: In business for decades, Gaumer’s offers shoppers the chance to learn about local mining history while exploring displays and exhibits featuring gems, minerals and custom-made jewelry. Follow I-5 (formerly known as Hwy 99W) north from Sacramento until you reach Hwy 32 and follow it east to Chico. Follow CA70/Hwy 99E north from Sacramento to Marysville and then continue north thru farmland and orchards on CA70 to Oroville, swinging west on CA149 to Chico. A trip along Northern California’s Historic Hwy 99E promises plenty for art lovers, antiques hunters and history buffs. Make the whole trip in a weekend, or slow things down and branch out to the magnificent national forests and parks surrounding Chico and Red Bluff for a big dose of natural wonder. Don’t own an RV? No problem—nothing could be easier than picking up your reserved motorhome rental in Sacramento, or if you’re planning to extend your trip to enjoy the Bay Area, our San Francisco location is waiting to help. We hope you’ll add your trip report to the Comments below! What Will You Find While Camping in the Everglades? Exploring the vast national park that encompasses the Florida Everglades is an adventure every RV camper should experience. The wildlife, scenery and enormous land and water mass of Everglades National Park come together to create an unparalleled camping experience. If you’ve never been, you may be wondering if it’s all about ‘gators and airboats, but there’s so much more to discover when you come to South Florida’s ecological treasure. The National Park Service serves up top-notch camping facilities in all fifty states, and campgrounds at Everglades National Park are no exception. Two campgrounds within the National Park can accommodate RVs—Flamingo Campground and Long Pine Key Campground. You may find portions of the campgrounds closed during wet season (May to October) but they are both wide open and welcoming campers every day from November to April. If you choose to camp at Long Pine Key, you’ll be on the Park’s southeast side, near the Homestead entrance. The quickest route is through Miami, south on the Florida Turnpike to Florida City. This plan positions you to explore the Long Pine Key Trail (see below) and the wildlife-rich trails connected to the Royal Palm Visitor Center. This is a no-hookups campground but water and a dump station are available. Campsites are first-come, first-served. Farther south, at Florida’s most southern tip, Flamingo Campground has developed campsites, dump stations and solar showers. It’s also accessed via the Homestead entrance by traveling about forty miles into the park past Long Pine Key and the Pa-Hay-Okee Overlook to the Flamingo Visitor Center. Camping at Flamingo puts you close to plenty of outdoor adventure, with easy access to water and hiking trails. We strongly advise reserving your campsite if you plan to stay at Flamingo Campground during the winter months. With more than a million acres covering the gamut from sawgrass prairie to mangrove swamps, you won’t miss out on wildlife watching opportunities when you visit the Everglades. As you hike the trails, take a tram tour, paddle a canoe or take advantage of access points like the Shark Valley observation tower, you might just see not only alligators but also saltwater crocodiles, West Indian Manatees, bottle-nosed dolphins, several species of bats and an abundance of wading birds. Depending on the habitat, you may cross paths with raccoons, grey fox, river otters and flying squirrels. Keep your eyes on the ‘River of Grass’ in all its forms—there’s always some kind of creature making its way through this one-of-a-kind sanctuary. We’ve mentioned wildlife viewing and RV camping, but what else is there to do outdoors at Everglades National Park? Plenty! Anhinga and Gumbo-Limbo Hiking Trails, Royal Palm Visitor Center: Anhinga Trail is a little less than a mile long, full loop, and is accessible. Lots of bird and wildlife watching along the way. The shorter, quarter mile, Gumbo-Limbo Trail is also paved and wheelchair accessible, offering a quick view of the coastal hammock habitat. Bayshore Loop Hiking Trail: Two miles long and offering a view of Florida Bay, this trail can be reached via the Flamingo Campground. Shark Valley Biking Scenic Loop: This fifteen mile bike trail is for experienced bicyclists able to make the whole loop, but it is also a terrific opportunity to observe wildlife, birds and the ever-changing landscape of the Everglades. If you’re not up for the bike ride, tram tours are also available for this loop. Ten Thousand Islands Water Trails: Experienced paddlers will find the perfect challenge by following one of the water trails along the Gulf Coast of the Everglades. Start at the canoe launch at Everglades City and follow your chosen trail toward Big Cypress National Preserve. Not confident of your ability to paddle these backcountry trails safely? There are boat tours available, so you won’t miss out on the mystery and beauty of this vast wilderness area. You can also indulge in saltwater and freshwater fishing at many spots throughout the National Park. Check the website for information on other activities such as birdwatching, kayaking and eco tours for an in-depth Everglades experience. Setting up camp in Florida’s Everglades National Park can be the beginning of one of your best RV vacations. Make plans to visit now by reserving your Miami RV rental and planning your Everglades activities. The River of Grass is waiting to take you on the ultimate outdoor adventure. Does your family need new ideas for making your family reunions fun for all ages? Why not plan a reunion in the great outdoors, complete with RV comfort and convenience? We’ve pulled together the perfect plan for bringing your family together for an RV camping reunion. Start floating the idea to one and all that you’d like to go camping for this year’s reunion. Once your relatives have agreed that camping together sounds like a blast, your next step is to find out how many motorhomes your extended family already has. You might be surprised to learn that Cousin Jerry regularly camps in a fifth-wheel and Uncle Joe has driven his Class A ‘bus style’ RV from New York to LA. Once you’ve taken inventory of available motorhomes, you can do the next two steps—pick your location and rent RVs for the overflow. Asking what style motorhomes are already in the family helps you choose the right location and type of campground. Some larger RVs, for example, require 50amp hookups, so you’ll need to look for a campground with that amenity. But the biggest consideration is what reunion activities will the family enjoy? Will your relatives want to fish, boat and swim? A lakeside campground at a scenic state park would be a great choice. If the goal is to camp close to hiking and biking trails, investigate state parks, national parks or national recreation areas with plenty of room to roam. Remember to check for on-site or nearby campgrounds that can accommodate your size of group and reserve the sites you’ll need before you go. More thoughts on location—if your relatives love the idea of mountain camping, consider Rocky Mountain National Park in Colorado or Grand Teton National Park in Wyoming. For a gathering of sun-worshipping siblings, why not book several campsites at Doheny State Beach in Dana Point, CA? We’re blessed in the USA to have national parks, state parks and camper-friendly lakes and rivers all over the map. Email some location ideas to your clan and reserve your campsites based on their top picks. Some families will find that there are plenty of motorhome beds to accommodate their gathering. If you determine, however, that you’re short an RV or two, don’t panic! We’re happy to help set up RV rentals, either in your loved ones’ home cities or near your family camping destination. 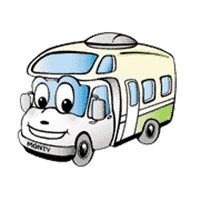 Use this quick link to access the types of motorhomes we offer and where you can rent them. The success of any family reunion is in the details, and an RV camping reunion is no exception! With a place to gather chosen and accommodations reserved, all that’s left is to decide who will bring what and how much. Will one person purchase groceries for the group or each family bring their own? Potluck meals are always fun and give campers the chance to show off their outdoor cooking skills. A rookie reunion camping mistake is assuming everyone will know what to bring! All it takes is a little communication to settle details such as who will bring groceries, camp stoves and utensils, what equipment is needed for group activities and any special regulations in place at your venue. If your location has a website with camping and activity information, send the link to your loved ones so they’ll know what to expect. Planning your RV camping family reunion doesn’t have to be a full-time job. Plan together to pick a great spot, make sure you have the RVs you need and settle the details for meals and activities before you’re thirty miles from a Walmart. Because you’ve planned well, your RV camping family reunion is liable to become a cherished family tradition. Every year, it seems there’s a hot new travel destination that beckons to RVers from the travel blogs. But what about the tried-and-true wonders of nature, the ones that have thrilled and amazed since the first North American inhabitants peered into a cave, over a canyon rim or across a vast expanse of water? One of the most famous of those American wonders is Carlsbad Caverns National Park in southeastern New Mexico. Since a sixteen year old cowboy wandered into the cave’s entrance in 1898, visitors have been fascinated by the enormous underground chambers, intricate soda straws, curtains and other rock formations and the wildlife that calls the caverns home. It’s time for a new generation of families to discover why Carlsbad Caverns National Park is an ideal destination for their next RV camping adventure. Where Will You Go, What Will You See? If you’ve never come to Carlsbad Caverns, you may be surprised to find there are many ways to explore the caves. Guided tours led by park rangers show visitors the highlights of some of the major caverns. Two of the most popular—the King’s Palace and Left Hand Tunnel tours. You can also venture on your own into some of the underground chambers. Here’s more detail on the self-guided tours. If you’re up for a demanding hike to the bottom (1.25 miles), this tour is the one for you. Active RV travelers will follow a twisting path down seven stories into the cave. Not a good choice for those with health issues, but there are plenty of other places to explore that don’t require such a hike. Good news—there are elevators at the bottom of the tour if trip down proves strenuous! This mile-long circular route explores the largest underground cavern. A good choice for those with difficulty walking, this trip will take you past extraordinary sights like the Painted Grotto and the Giant Dome. Take the elevator to the starting point and be prepared to be thrilled at the colors and formations you’ll see. No matter which tours you choose to take, keep an eye out for the enormous cave swallow flock that calls these caverns home! Throughout this vast desert park in the Guadalupe Mountains, you’re likely to see a wide range of reptiles, amphibians, mammals and birds. Children under age four are not permitted on guided tours, strollers are not permitted on some routes. Be sure to check the link above for age restrictions. What to wear in the cave: it’s cool underground, so bring a jacket or sweater. Also, leave the flip-flops in the RV and wear comfortable, rubber-soled walking shoes to avoid slipping on the paths. If you’ve visited another cave recently, wear different shoes or be prepared for a quick cleaning process before you’re allowed into the cave. Reserve your tickets in advance for guided tours to avoid delays. Save time to take a hike on one of the Park’s nature trails surrounding the caverns—the Chihuahuan Desert is rich with secrets of its own! Join the crowd in the natural amphitheater at the entrance to the cave at dusk from May to October to watch the evening bat flight, when great swarms of bats leave the cave to hunt for insects. From the Hall of the White Giant to mysterious Spider Cave (seen only by those willing to crawl along a subterranean passage) Carlsbad Caverns National Park is an eye-opening adventure. Traveling there by motorhome will make your trip even more memorable, thanks to the luxury and convenience it provides. Wherever you decide to pick up an El Monte RV rental, isn’t it time to start planning your trip? Become part of the new generation of RV travelers to New Mexico to discover the awesome beauty of Carlsbad Caverns. Are you looking for new ways to enjoy the great outdoors while RV camping in Arizona? Why not try Tucson, home to year-round campgrounds and some of the prettiest desert scenery around? To spark your imagination, we’ve collected helpful tips on five day trips you’ll want to take while in Tucson. Let’s start our tour by saying that the weather in Tucson is fabulous for a winter holiday vacation. With highs in the 70s and lows in the 50s, it’s perfect for hiking, biking and sightseeing to your heart’s content. And that’s a good thing, because our first day trip suggestion is to Saguaro National Park, a hiking and biking paradise divided by the city of Tucson. Photograph the giant saguaro cacti in the Tucson Mountain District to the west or take one of the Rincon Mountain District’s scenic drives or trails to the east of the city. Either way (or both!) it’s going to be a memorable experience. There’s no camping in the National Park, which closes to motor vehicle traffic at sunset, but there’s plenty of camping nearby. Campgrounds such as Desert Trails RV Park, Prince of Tucson RV Park and Whispering Palms RV Park help keep RV camping in Tucson pleasant and affordable. The second day trip suggestion we’d like to make for Tucson visitors is a picnic/hiking day at Agua Caliente Park. Once a warms springs resort and ranch, this lovely spot offers palm tree-lined trails around the springs, as well as historical ranch structures to explore. Your third day in Tucson wouldn’t be complete without a visit to Sabino Canyon in the vast Coronado National Forest. Less than thirty minutes from downtown Tucson, this hauntingly beautiful setting can be seen by tram or on one of the many trails. On Day Five, let’s take a quick road trip about an hour south of Tucson to Kartchner Caverns State Park. Pack a picnic lunch in that convenient RV kitchen and then head underground for one of the tours through these caves’ most spectacular rooms. It’s southern Arizona from a whole new perspective! These are just five of the ways travelers to Tucson can amuse themselves on a camping trip. Take the bikes, hiking gear and cameras and take full advantage of the natural beauty in and around this exciting Arizona city. We’re happy to help with an Arizona RV rental, so be sure to give us a call as you make your plan. The comfort of an RV, combined with hundreds of ways to have outdoor fun in the Tucson area, make RV camping in Tucson the way to go this winter. What are you favorite day trips when camping near Tucson? Let your fellow readers know by commenting on this post.